After numerous citizens have reported on horrible sights of horses pulling wood every day from the forest for the Sumarija Samobor (Samobor Forestry Office), Animal Friends inspected a dilapidated stable by the Bregana road, just behind "Eko selo." One could guess that it was "inhabited" only by a heap of manure next to the stable. 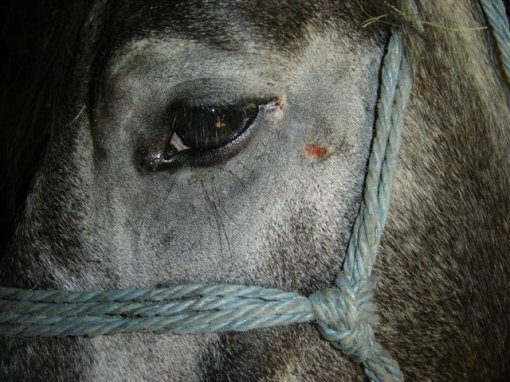 In the stable, there are horses with open wounds all over their tormented bodies. What kind of sufferings they go through when pulling wood is easily seen in their empty and lifeless look, which speaks about another human heartlessness towards other animal species. Open wounds on their skinny bodies bleed every day anew because of the friction, sweat, dirt and heavy load they are forced to carry. On their backs there are by now already stiff blankets and pack saddles, to which heavy wood is attached which the horses are forced to pull from the forest, beyond their endurance. The horses' owner, but by no means their guardian, is Mr. Dario Juric, whose trade is registered under the name "Promet Juric, drvo, sjeca i izvlacenje" (Juric Trade, Wood, Hewing and Pulling) at the address of Donji Macelj 74, 49225 Donji Macelj. Animal Friends has reported Mr. Juric to the veterinary inspectorate for overworking animals (Animal Welfare Act, Article 5.1.) and has also brought charges against Mr. Juric for willfully abusing and torturing animals (Criminal Law, Article 260). Animal Friends strongly condemns the indifference of Samobor Forestry Office, for which the helpless horses pull wood, and they insist that exploiting animals for human profit and their intentional exposing to suffering be publicly condemned and severely punished. Visit the photo gallery of wounded horses in Bregana.